Most of the time video game loading screens keep it pretty chill. They show some art, maybe share a helpful tip or two. Sometimes they're just a black screen and a spinning wheel. But sometimes... sometimes, video game loading screens go crazy in the best possible way. Minor spoilers for Thief follow. 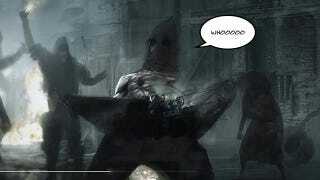 I didn't think much of Thief, but some of its loading screens are outstanding. As the game's story progresses, things begin to deteriorate in The City, which is the name of the city where the game takes place. The strife is rarely really seen in the game itself, but the story events all hint at a town gone to riot and ruin. We've got this maniac Ku Klux Klan-lookin' dude whipping open his trenchcoat like the world's wildest flasher, pulling on the strings on a… like… is that a bomb? Or some sort of fireworks display? Is this guy a steampunk Data, and is a boxing glove about to pop out of his belt? I have no idea what is going on in this loading screen. After the game finishes loading, it puts you out in The City and everything's pretty much the same as it ever was. There are allegedly riots going on but there aren't really any crowds in the streets, and you certainly never really run into that dude, or any dudes wearing robes like that. The game never explains what the hell the device over his crotch is, either. And so we are left to wonder. But hey, I'm not complaining. If you give me a choice between regular, boring loading screens and this kind of madness, I'll take the madness every time.